A-B: From the middle of the chest (point A) and let the tape go along the neckline, upon the withers. 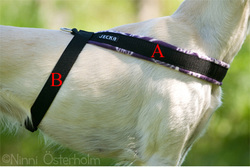 B-C: Base point B, then a third of the dogs back. A-D: From point A, in between the front legs and along the rib cage until it ends (point D). Make sure you measure behind the rib cage! This is important so your dog can't escape from the harness. 2: Around the waist. Base point C.
A: Just behind the withers, around neck and back. 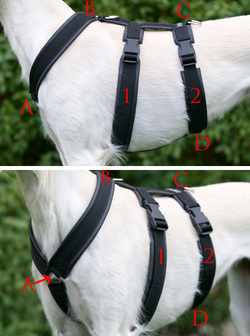 Measure as walkingharness, but also use the measure A-D from the DT harness. Neckmeasurement: Just below the ears. Measure also around the head, so the collar can slip on and off easily.